The latest news just in from Tim Johnson in Ardell's Fort Lauderdale office is that he's just signed the 35m megayacht Codene_ _for sale. Built in 2004 by Tenix Defence in Australia, she's a long-range expedition yacht that's proved popular on the charter market. Accommodating 10 guests in a main deck master, two doubles and two twins, she also has large teak deck areas suitable for relaxing or entertaining. 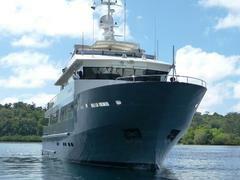 Currently lying in New Zealand, Codene_ _is asking $9.95 million.